Use natural controls to deter these damaging pests. As the weather cools, the rain increases and the humidity rises, our plants are happily growing and enjoying the weather after such a hot summer. Tender new foliage springs from the ground. New vegetables are planted, excited for a first harvest. But, lo and behold, you realize your plants are being devoured as quickly as you plant them! What could it be? Well, if it recently rained and the weather has remained mild, perhaps with a bit of detective work, you’ll find slugs sliming around your garden beds. While small in stature and slow in speed, don’t let them fool you, they’ll eat twice their body weight in a single day. There is no limit to the damage these shell-less mollusks will wreak upon your landscape. With the wet season approaching, what can you do to deter them? Those of you with shady, moist landscapes are no stranger to slugs. They prefer dark, damp areas of the garden. 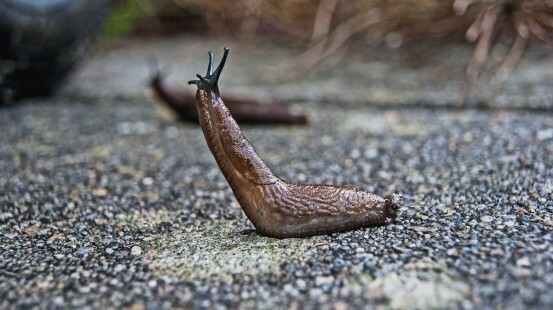 Think like a slug… where are the wettest parts of your garden? Under a leaky faucet, the mulch near the damaged irrigation, empty shallow pots left in the garden after a rain or entire landscapes improperly watered at night and never allowed to fully dry. These are a slug’s favorite places. Deterrence is your best bet to keeping plants safe from slugs. An organically kept landscape that is properly watered, has good soil drainage, and a well working irrigation system will be the least tempting environment for slugs. Non-poisonous snakes, toads, birds and other creatures will also make your organic garden their home and keep your population of bad pests down, including slugs. To keep the landscape dry and plants well-watered by watering during the day, especially once the weather cools and the shorter days of sunlight may not fully allow your landscape to dry before it’s watered again. During rainier months, you may not need to run your sprinkler system at all – or only once or twice. If we’ve received at least 1-inch worth of natural rainfall in a week, there’s no need for you to run your irrigation system. Have slugs already invaded? Diatomaceous earth and pecan shells are natural slug eradicators and deterrents that can be sprinkled around the base of plants and aren’t harmful to much of the wildlife in your garden. You can also find other natural slug deterrents with a quick search online or during a visit to your garden center.